from the McDonough School of Business. 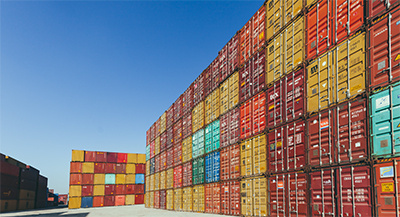 As the largest importer in the world, the United States obtains about 13% of global goods and services from other countries – diverse as China, Canada and Mexico. The United States tends to buy more than it sells. Americans have access to worldwide products and none has to go overseas to get it. But does this mean they have access to everything? And if not, what new inventions and innovations is the United States missing out on? While everyone talks about exports, we focus on the so often maligned imports. Exports make imports possible, which enhances selection, competition, and competitiveness. With already a shining city on the hill, how can things get even better? Our team of hands-on experts, exposed to products from around the globe. They are a group of seniors the McDonough School of Business at Georgetown University. We asked them to give us a closer look into what the US should import more of. Students explore new motivations for US imports to include goods and services from a wide array of industries ranging from fine foods to health and technology. Technology has effectively become the center of our lives. Students believe that the US should dedicate its import efforts on innovative products that will enhance tech performance and connectivity. The United States currently can only support 4G services to telephones. Korea, on the other hand, has been using 5G recently, which has provided them the opportunity to grow faster and be more flexible than the U.S. There now is a lucrative market for portable chargers. As they are cheaper to import than to produce, the US is more likely better off importing battery pack rentals from China. The need for tech innovation is not limited to mobile phones, but includes automobiles and health. With rising auto tariffs, the United States will have decreasing access to advanced automotive engineering technologies. Specifically, foreign markets sell sleek pickup trucks, which are not available in the United States and penetrate Asia and Sub-Saharan Africa. Access to such advanced forms of auto engineering will benefit US consumers. Innovation will also support health sector advances. There was demand for robotic goods. Japan was credited with very advanced medical robotics. The Kibo Experiment Module allowed fixing problems on the International Space Station without having to send a human into space. Similarly, robots are used in Japan right now in order to have a more precise and efficient way of significantly treating cancer patients. There are also bionic arms for upper-limb amputees, customizable for each wearer. Children can update their arms as their bodies grow. Such technologies should be brought to the US, where many individuals have received damage to their limbs. There also is demand for simple technologies and ideas that effectively improve the wellness and wellbeing of individuals. Asian face-masks mitigate pollution-related health risks. The Water-Leech - a tank that absorbs and retains water runoff from a shower, bath or sink – was found to be a product worth importing from Australia. This tank allows consumers to save water instead of wasting it down the drain. Other ideas included public spaces where communities can be given the chance to exercise and socialize in order to become more active and engage with others. Colombia’s Ciclovias, where some of the main roads in Bogota are closed off for cars and open to pedestrians who want to bike, walk or simply chill, inspired such leisure spaces well worth importing. Discussed was leisure time at work: 2 – 3 hours for a mid-day nap, otherwise known as siestas. The Spanish’s rendition of the traditional American lunch break could potentially attract more millennials into the workplace, and add massive value for employees, particularly those who work in innovative, creative industries. Cultural innovation was not limited to the workplace. In this increasingly globalized world, it was important to understand different cultures. How do different backgrounds and upbringings result in contrasting approaches to the same situation? Students observed a need for educational exchange programs that remove students from their comfort zones in order to truly experience a variety of different cultures. New exchange programs will completely immerse students into the culture. Most relevant is the opportunity to explore underdeveloped and remote areas of the world, which will eventually be part of all’s underbelly. While the US has access to a range of premium goods and services, imports can be crucial in providing the finer things in life. Students called on the need for luxury, fine foods to task Americans’ taste buds. There was strong appeal of wines from France, Italy and Spain, particularly when paired with refined, imported cheese. Australian marinated goat cheese for $12 per 11oz jar will perhaps be the next luxurious brand of food. Perceptions of luxury was not limited to goods, but extended also to services. Specifically, in Switzerland, the world-renowned Paracelsus Clinic offers unparalleled medical services that, in a perfect world, would be available in the United States as well. Paracelsus Recovery, founded in 2012, offers a unique “luxury treatment program” for clients struggling with addiction, including substance abuse and mental disorders. Patients live in a luxury residence with a team of international doctors that specialize in their condition. Attention of approximately 15 doctors is solely focused on the patient and their needs. Yet, the cost structure is expensive. At present, the recovery group charges $80,000 Swiss Francs a week, or the equivalent of USD $81,300.80. Imports are good, but need to be fair. Our students understand and support such restraints, yet know that selection and diverseness is a strong pivot enriching lives. Professor Michael R. Czinkota teaches international marketing and trade at the University of Kent in Canterbury and Georgetown University. His latest book is “In Search For The Soul of International Business”, 2019. Dina El-Saharty is a second-year Communication, Culture, and Technology (CCT) graduate student at Georgetown University, specializing in visual communication design and persuasive communication.